All of the keys have an immobilizer system. The immobilizer system helps to protect against vehicle theft. 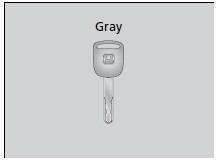 The keys contain precision electronics. • Do not leave the keys in direct sunlight, or in locations with high temperature or high humidity. • Do not drop the keys or set heavy objects on them. • Keep the keys away from liquids. • Do not take the keys apart except for replacing the battery. If the circuits in the keys are damaged, the engine may not start, and the remote transmitter may not work. If the keys do not work properly, have them inspected by a dealer. Use the keys to start and stop the engine, to lock and unlock the doors and to open the trunk. You can also use the remote transmitter or smart entry system* to lock and unlock the doors and to open the trunk. There is a panic button in the remote transmitter. The built-in key can be used to lock/unlock the doors when the smart entry remote battery becomes weak and the power door lock/ unlock operation is disabled. 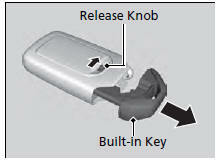 To remove the built-in key, pull it out while sliding the release knob. 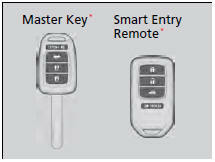 To reinstall the builtin key, push the built-in key into the smart entry remote until it clicks. Can be used to start and stop the engine, and lock and unlock driver's door. When you need to leave a key with a third party, leave the valet key.